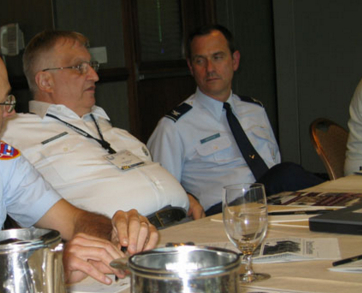 Since Sunday night, at least nine members of the Civil Air Patrol (CAP) have called News of the Force about the presentation by Col Len Blascovich, the CAP’s National Historian, gave at the recent CAP National Board meeting in Virginia. Some were present for that presentation, but we do not have to rely on their reports. The CAP has posted the Power Points and the videos on their website at this Link. Some, were confused. They are aware there is – or was – an IG complaint concerning members who have been misappropriating historical CAP artifacts for their own personal collections or selling them for personal profit. NOTF reported this some months ago. They wanted to know if the fact that Col Blascovich was talking about that complaint and its issues meant that the investigation has been completed and decisions made. We don’t know and we haven’t heard anything to that effect. If Len knows about the complaint, which he clearly does and it hasn’t been decided, then we think he was probably required to sign a non-disclosure agreement (which the CAP is famous for requiring in an effort to keep a lid on almost anything) and he may be in violation of that. NOTF has had some calls from people who were angry because they thought they were still held to such agreements. If those are complainants, the rules require that they be notified of any outcomes. That suggests there hasn’t been a decision. We’re pretty sure that if the CAP side of all this unilaterally breaches that agreement, then the agreement is null and void and everyone else is free talk publicly. Col Blascovich threw up several slides of items in a storage facility near Baltimore, MD. Bill Schell, the former national curator of the CAP, died in March 2009, leaving a houseful of CAP artifacts he was inventorying. But that would have nothing to do with the theft complaint. The theft complaint – or complaints – have grown and it has been charged that certain people who are involved in the CAP’s history outreach were taking items into their “personal collections,” creating no paperwork trails, and appropriating the items without registering them on any inventory. We are aware of two specific items that were at issue: one was a uniform that belonged to the late Winship Nunnally, a founding father of the CAP and the first CAP Georgia Wing commander. The person charged with this stated it was in his “private collection” and in “personal storage.” The other is a footlocker that was donated by the family of John Curry, the first national commander of the CAP. Blascovich makes no assertions and provides no proof these are in the collection, and he doesn’t even mention them. One caller who is concerned about how that inventory was taken has some reason for concern. Some of the people charged with taking that inventory are people who were also charged in the theft complaint. or with participating in a cover up or, at the very least, they are buddies. If there hasn’t been a decision on the theft complaint, this could get interesting. If there has been no decision, then how is it that Blascovich -instead of the national commander – is announcing this decision? We’ve been told this is supposed to be Gen Carr’s decision. If any of the charged are found guilty, then that also disproves Blascovich’s assertion that nothing was stolen and noting was missing (that’s in the video – some-where after minute #14). Where is Gen Carr, anyway? No one seems to hear anything from him. Still, there’s a lot that’s just weird about this presentation. Blascovich says that the people in the history program haven’t been able to fund-raise because of this IG complaint. Then, what if the complaint isn’t complete yet, and the charged are found guilty? Be the first to comment on "CAP Smoke & Mirrors"